The staff of East Zion Adventures will conduct all guided ATV tours at Zion Ponderosa Ranch Resort. Our new ATVs have the muscle to climb high hills and cross deep streambeds. ATVs are the US Postal Service of the Ranch-"come rain or shine." The worse the weather, the more the fun! 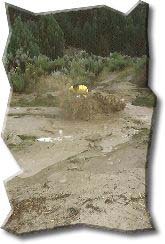 ATVs are quite often the only vehicles that can make it to most areas of the ranch, despite heavy rain or snow. East Zion Adventures will provide all necessary gear, including: helmets, goggles, gloves and rain gear, to make the ATV rides an awesome experience in any type of weather. Your tour guide will take the time to explain all features of the ATV prior to beginning the ride. A short driving course will be provided to assess guest's ability. Guests will be required to sign and comply with a pre-stated list of rules. Any guest that breaks ATV rules or displays reckless driving will be dismissed from further ATV rides. Zion Ponderosa Ranch Resort is an all-inclusive adventure resort located on the east rim of the Zion National Park. The Ranch is located high in the pines at nearly 6,500 feet above sea level, on the east plateau overlooking the Park. Surrounded by a forest of ponderosa pine, pinion pine, juniper, and wild oak, Zion Ponderosa was once home to a pioneer logging camp. Many of the old pioneer trails and roads remain and provide guests of the ranch rides through rugged, Rocky Mountain high country.